The Yu-Gi-Oh! TRADING CARD GAME 2018 Mega-Tins bring the heat this Summer with some of the past year’s most popular cards AND brand-new cards designed specifically for these Tins! 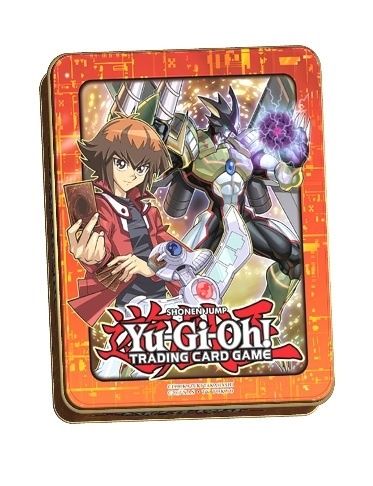 Each Tin includes three 16-card Mega-Packs containing cards from Yu-Gi-Oh! TRADING CARD GAME Maximum Crisis, Yu-Gi-Oh! TRADING CARD GAME Code of the Duelist, Yu-Gi-Oh! TRADING CARD GAME Circuit Break, and Yu-Gi-Oh! TRADING CARD GAME Extreme Force. These Mega-Packs use the traditional “1 card of each foil rarity” plus a Rare and 12 Commons configuration native to the Mega-Tins, and all cards appearing in the Mega-Packs will be included in their original booster set rarity, so you could have another chance to get popular cards like Borreload Dragon, Dragonic Diagram, Evenly Matched, or Saryuja Skull Dread. Each Yu-Gi-Oh! TRADING CARD GAME 2018 Mega-Tin will also include additional non-randomized variant cards, as well as one unique new card designed specifically for that Tin! These new cards are based on the Decks used by Jaden the hero of the Yu-Gi-Oh! GX and Yu-Gi-Oh! 5D’s manga and animated series.